When it comes to defining the sounds of the 1970s and 1980s one single instrument stands out - the analogue synthesiser, as Mark Patrick of Mouser Electronics explains. Jean-Michel Jarre, Herbie Hancock, Gary Numan, Kraftwerk, Depeche Mode, Rick Wakeman, and many others, composed classic tracks using them. The late Keith Emerson (pictured above astride his colossal Moog Modular) even played his massive Moog Modular synth on stage. Those of us growing up in that era can probably all remember favourite tunes that used the distinctive voices of an analogue synth. Who can’t remember Jan Hammer’s soundtrack opening up their weekly fix of Miami Vice for instance? Many of the names that manufactured synths during that formative period still exist today, alongside other new names producing synths, samplers and drum machines. Established synth makers, such as Korg, Moog and Roland, are still among the current commercial leaders - although the general market trend has been towards the use of digital design with digital signal processors (DSPs) that endeavour to replicate analogue sounds, and software synths, some of which aim to mimic older hardware synth models. Hybrid synths that combine the best of analogue and digital circuitry have also emerged and a new generation of makers are reigniting an interest in analogue synths through a variety of projects. They say that imitation is the best form of flattery, and in this context many of the modern-day hardware and software-based synths include emulation modes or features from the best synths of the 1970s/80s era. So what makes these vintage analogue synths so attractive? The Minimoog, for example, a monophonic synth was designed to be a compact synth that could operate without any patch cables, bucking the trend of large and cumbersome modular units, and included three voltage controlled oscillators (VCOs) which gave it a rather unique ‘fat’ sound. With two VCOs per voice, the polyphonic 8-voice Jupiter 8 was Roland’s flagship synth of the early 1980s and is still highly sought after today, some 37 years after it was originally launched. It was also the first synth able to split the keyboard into two zones, offering a different sound in each. The wide variety of sounds it could produce made it a favourite of many bands of the time and it has secured a place in the list of must-have vintage synths as a result. Other synth models gained traction during this time, with names such as Sequential Circuits, Yamaha and Oberheim among the most notable. In turn, the growth of synth manufacturers created a demand for specialist ICs that could replace a discrete approach to building the VCO, voltage controlled filter (VCF) and voltage controlled amplifier (VCA)) circuitry. Companies such as Curtis Electromusic (CEM) and Solid State Machines (SSM) developed chips that were widely adopted in the market. Devices such as the CEM3340 precision VCO IC were designed into many of the leading synths in the early 1980s, like Sequential Circuits’ Prophet 1 and the Oberheim OB-X. Not only did these ICs provide far more stable oscillator circuits, they also helped to dramatically reduce the space required - particularly for poly-synths that were becoming equipped with more and more functionality. The SSM 2030 VCO IC also became extremely popular. As component technology evolved, synth manufacturers moved towards digital designs and the use of software-driven ‘soft-synths’. Consequently, demand for these special ICs declined and production ceased, creating a serious challenge for anyone who wants to restore/repair analogue synths today. The CEM3340 was reissued many years after its initial design, and you might be lucky enough to occasionally find them or the SSM devices on eBay. For those interested, there is a complete listing of the CEM and SSM ICs together with the synths in which they were used on Wikipedia. Some of the other ICs that found their way into analogue synths were rather more fortunate in terms of continuing support and product availability. For example, the 8-bit Zilog Z80 microprocessor, was first used by Roland in the Jupiter 8 to control the patch configurations and continued into newer products, such as the SH101 (a compact 23-key monophonic synth that was introduced in late 1982). Launched in 1976 and still available today, the Z80 became the most commonly used processor in home computers through to the mid-1980s. Whether hardware, digital emulation, or soft-synth emulation, the main functional blocks of a true synthesiser remain the same. These are the VCO, VCA and VCF. The principle sound generating circuit is the VCO. 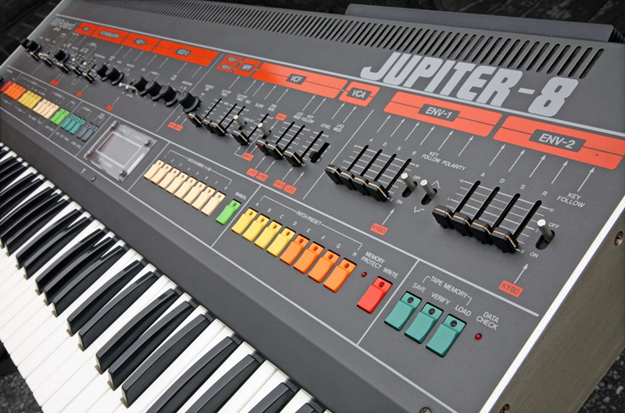 The Jupiter 8 mentioned earlier, has 16 VCOs in total, every one being individually controllable. Each VCO usually has a number of possible settings, from the ‘pure’ sine wave to the more harmonically rich saw-tooth, ramp, square, triangle and rectangle waveforms. A VCO needs to be able to track across at least eight octaves from its control voltage (CV) input. Also, some VCOs provide the option to adjust the output frequency in a linear manner in addition to the normal exponential one volt per octave CV. These filtering components give ‘sound-shaping’ capabilities to the synths output. Using a combination of low, high and band pass filter responses, VCFs can filter out harmonics or select a narrow frequency range all through a CV input, which in turn might come from an ow frequency oscillator (LFO), or another form of VCO. The resulting sound combinations are potentially endless. A synths’ VCA provides control over the sounds amplitude across its waveform. There are distinct parts to a sounds waveform, these are respectively called the attack (this covers the initial rise), decay (the fall off), sustain (held) and release (the end). Special ADSR integrated circuits (ICs) are available that provide complete control of a waveform’s envelope. As their names suggest, these functional blocks are all voltage controlled. It was Robert Moog, whose name is synonymous with the development of analogue synths, that set the ‘one volt per octave’ standard - which was quickly adopted by all synth manufacturers. For example, consider a VCO running at 200Hz with a 0V control voltage. A 1V control voltage input would then take the VCO output to 400Hz, and a 2V input would result in a 800Hz output. The core parts of a synth are all fundamentally voltage controlled and include VCOs, VCFs, VCAs, plus LFOs - all of which can be used to modulate the outputs of the VCOs. The source of the voltage used to control the VCOs, VCFs, etc., can come from a variety of sources. A white noise generator, LFO, or the output from another VCO are both possible sources, but the output from a keyboard controller is most likely. Needless to say, when controlling any aspect of the synth’s voices, the accuracy of voltage control is essential. Temperature compensation, tight supply voltage regulation and minimising the effects of electro-magnetic interference (EMI) are all crucial too. The VCOs also need to track the supplied voltage precisely, since even the slightest deviation from the tone scale will be discernible. For those engineers tempted to experiment with creating their own analogue synth there are a number of open source designs available, of which the Noise Toaster has proved to be extremely popular. It features a white noise generator, VCO, VCF, VCA and LFO components, as well as an attack release envelope generator (AREG). A 1W audio amplifier is also incorporated. The VCO offers either a ramp or square wave output, and can be used to control the VCF. A pair of LM324 quad low power op-amp devices are used for the VCO, VCF and LFO circuits. An LM386N4 is used as the audio amplifier. A full BoM for the Noise Toaster (not including the case or PCB, which can be bought directly) is available from the Mouser website. Acknowledging the resurgent interest in analogue synths, several manufacturers have re-released versions of their classic machines in new small form factors - such as Roland’s JP-08 and JU-06: 4 note miniature keyboard-less versions of their Jupiter 8 and Juno 106 poly-synths. Others, like Korg, have introduced tablet-based soft-synth emulations - taking advantage of the proliferation of mobile and tablet platforms. The analogue synth created a whole new genre of music and inspired musicians to experiment with sounds far beyond what was previously thought possible. The synths of today, albeit most of them create their sounds digitally, owe their very existence to the profound and lasting impression that legacy synths have made upon the music industry.